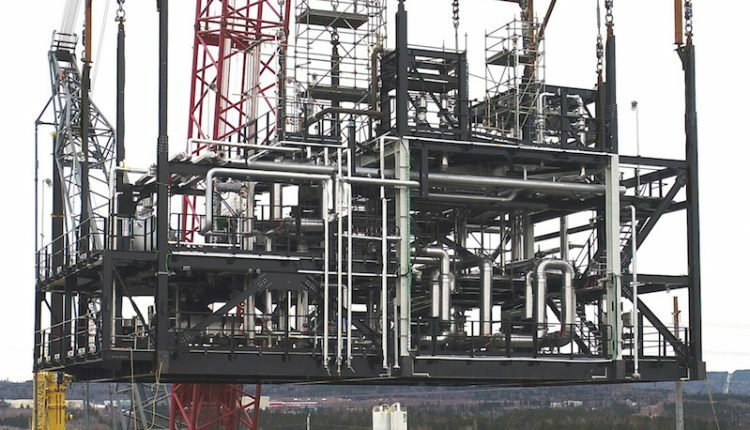 A dozen wireless Straightpoint (SP) load cells were added to a custom-built lifting frame that utilized 12 pick points to raise a pair of non-identical refinery modules at a major brownfield project at Saint John in New Brunswick, Canada recently. The 100-tonne capacity Radiolink plus dynamometers were provided by Stoney Creek, Ontario-based Equipment Corps Inc., which delivered the load monitoring solution to Irving Equipment, headquartered in Saint John. The latter also provided the Demag CC2800 crawler crane, equipped with a superlift. The equipment combined to complete a key phase of the oil refinery project, where a new processing unit was being installed. Once Irving had designed and fabricated the customized lifting frame, based on the refinery’s specifications, it needed a method of monitoring the loads so they could be certain that the forces generated during the lift did not exceed the design criteria; the modules had extremely tight deflection tolerances that had to be adhered to. Further, explained Irving’s Ryan Long, the height of rigging had to be kept to a minimum due to the weight of the lifts and to avoid the need for a larger crane. The frame was designed to pin directly to the hook of the Demag. Under the frame were a total of 82 55-ton shackles, 14 Crosby 2.75” turnbuckles, and four equalizer plates, in addition to the load cells. Long explained that a turnbuckle is a piece of rigging gear traditionally used in tensioning applications. They are adjustable in length by means of turning a center body around opposing screws. They are most commonly associated with utility pole guy-wires, he added. Each module had been transported from a barge by Irving using 36 axle lines of self-propelled modular transporters (SPMT). Equipment Corps then placed them onto supporting stools whilst the site made final preparations. The modules were transported approximately 2.5km on land and barged another 20km prior to being landed on those stools. Irving used a team of six people for the transportation and four people to execute the lift.